One of a kind! 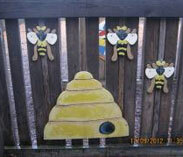 What fun to name each Bee with a child's name and the Beehive with your family name! Your generous donation will SAVE this original piece of artwork created by children of Pine Run Elementary. When you select this coveted artwork for sponsorship, it will ensure the proper restoration by our volunteer artists and will remain in our posssession. Your sponsorship will then entitle you to personalize the artwork with your family or business name and it will be hung in the castle for generations of children to enjoy. When your purchase is complete, a Save Kids Castle representative will contact you to discuss the details of the personalization. The king hasn't been able to fall asleep, because he can't count his sheep. 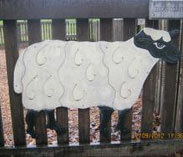 Help our fleecy friend get back to Kids Castle - baaaahh baaaahhh sponsor me! Your generous donation will save the artwork created by children of Pine Run Elementary. Upon placing your order, although you must choose "Store Pickup", this coveted original piece of artwork will remain in our possession. Your sponsorship of this piece will allow it to be restored, personalized and returned to the castle. A representative will contact you to discuss how to best personalize this piece. 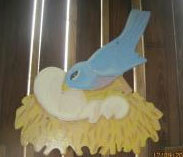 Mooravian barnyard bird and nest. Help this momma bird find their way back to the castle in time for her babies to hatch - SPONSOR ME! Your generous donation will SAVE this original piece of artwork created by children at Pine Run Elementary as part of the Moo-ravian Animal Barnyard Maze designed in the style of Henry Mercer's Moravian Tiles. When you select this coveted artwork for sponsorship, it will ensure the proper restoration by our volunteer artists and will remain in our posssession. Your sponsorship will then entitle you to personalize the artwork with your family or business name and it will be hung in the castle for generations of children to enjoy. When your purchase is complete, a Save Kids Castle representative will contact you to discuss the details of the personalization. 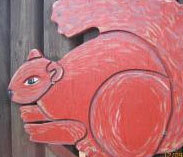 This squirrel is done stashing his nuts for the winter, he's ready to go to Kids Castle to play. Won't you help him? Your generous donation will SAVE this original piece of artwork created by children at Pine Run Elementary as part of the Moo-ravian Animal Barnyard Maze designed in honor of Henry Mercer's Moravian Tiles. When you select this coveted artwork for sponsorship, it will ensure the proper restoration by our volunteer artists and will remain in our posssession. Your sponsorship will then entitle you to personalize the artwork with your family or business name and it will be hung in the castle for generations of children to enjoy. When your purchase is complete, a Save Kids Castle representative will contact you to discuss the details of the personalization. One of a kind! Calling all you dog lovers! 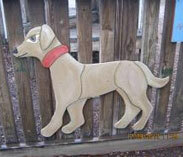 What a great idea to sponsor this piece in the name of your own beloved pet! Barn Cat part of the Mooravian Collection! This cool cat wants to stray back to the castle if you sponsor him today! 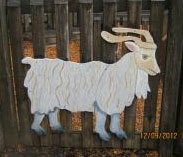 Part of the Mooravian Barnyard Collection: cute billy goat! Help him find his way back to the Royal Farm Yard by sponsoring him today! 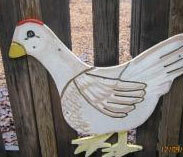 Cute little Mooravian barnyard chick! 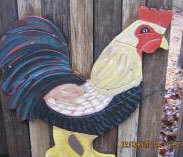 She wants to roam free in the Royal Barnyard, please help her get restored! Your generous donation will SAVE this original piece of artwork created by children at Pine Run Elementary as part of the Moo-ravian Animal Barnyard maze, in honor of Henry Mercer. When you select this coveted artwork for sponsorship, it will ensure the proper restoration by our volunteer artists and will remain in our posssession. Your sponsorship will then entitle you to personalize the artwork with your family or business name and it will be hung in the castle for generations of children to enjoy. When your purchase is complete, a Save Kids Castle representative will contact you to discuss the details of the personalization. The king and queen of Kids Castle have been oversleeping without their morning rooster call. Help him strut his way back to the castle and sponsor him today. Help Jack Spawrrow hide out in the Castle while he escapes the clutches of Davy Jones. This is a very special piece designed by local artist Elaine Pasqua with the help of students from Groveland Elementary School. 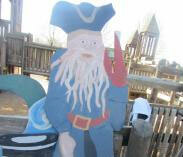 Jack stood watch on the playground ship, looking out for Davy Jones. Your generous donation will SAVE this original piece of artwork created by children at GROVELAND ELEMENTARY as part of the THE PIRATE SHIP. When you select this coveted artwork for sponsorship, it will ensure the proper restoration by our volunteer artists and will remain in our posssession. Your sponsorship will then entitle you to personalize the artwork with your family or business name and it will be hung inside the castle for generations of children to enjoy. When your purchase is complete, a Save Kids Castle representative will contact you to discuss the details of the personalization. 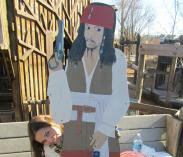 We need your help to restore Davy Jones so he can search about the castle for his nemesis Jack Sparrow. This artwork was designed by 6th grade students who attended Groveland Elementary in 2007 as part of the 10th anniversary restoration project. Your generous donation will SAVE this original piece of artwork created by children at GROVELAND ELEMENTARY as part of the THE PIRATE SHIP. When you select this coveted artwork for sponsorship, it will ensure the proper restoration by our volunteer artists and will remain in our posssession. Your sponsorship will then entitle you to personalize the artwork with your family or business name and it will be hung in the castle for generations of children to enjoy. When your purchase is complete, a Save Kids Castle representative will contact you to discuss the details of the personalization. 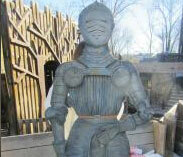 This life-sized knight will guard the castle from vandals! Become a castle defender and name this knight with your family's surname. Sponsor this Royal Knight who will stand guard over Kids Castle. 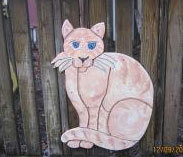 The original artwork was created by faculty and students at Titus Elementary School. By sponsoring this knight you will ensure he will stand guard to protect the castle for years to come. Your generous donation will SAVE this original piece of artwork created by children at TITUS Elementary. When you select this coveted artwork for sponsorship, it will ensure the proper restoration by our volunteer artists and will remain in our posssession. Your sponsorship will then entitle you to personalize the artwork with your family or business name and it will be hung in the castle for generations of children to enjoy. When your purchase is complete, a Save Kids Castle representative will contact you to discuss the details of the personalization. No castle would be complete without a treasure map, like Harry Potter's Marauder's Map, it could reveal all the secret passages inside the castle. But you must solemnly swear that you are up to no good! 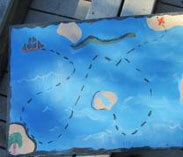 This large treasure map was part of the 10th anniversay restoration of the pirate ship.